The official color of Fall ’17 is Red and I am falling hard for it. Red is a very bold color and I love how it screams Power & Strength but at the same time represents Passion, Desire, and Love. Whenever I rock Red, I feel positive and energized. This past Thanksgiving Day holiday I decided to incorporate a pop of Red into my look. 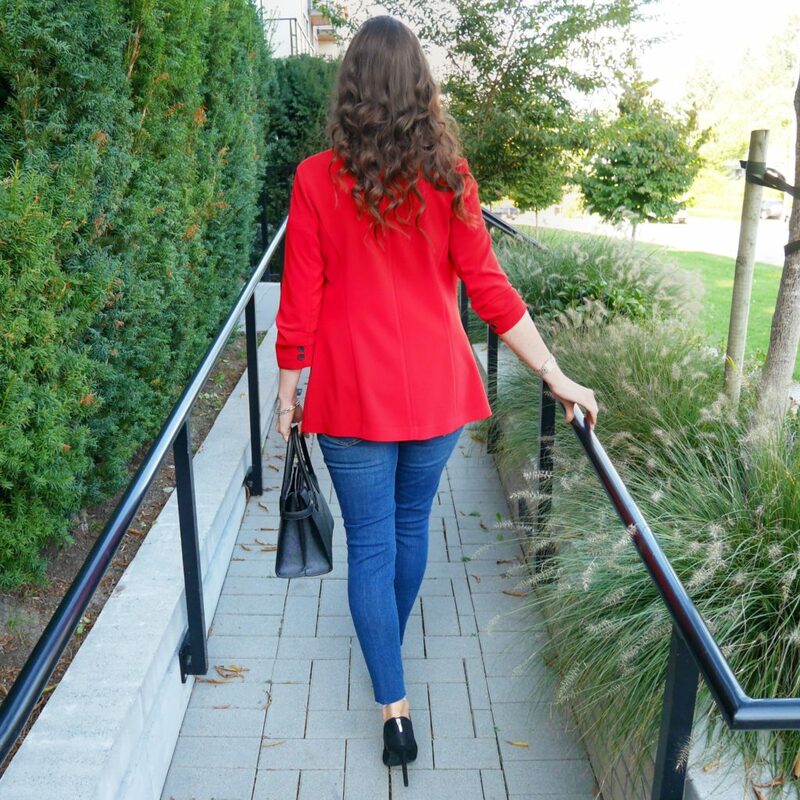 Today on the Blog I am sharing my OOTD details to inspire you to add some Red to your wardrobe this season. One of my favorite fashion staples that I cannot live without for Fall is a Blazer jacket. Blazer’s are stylish, versatile and most importantly comfortable. 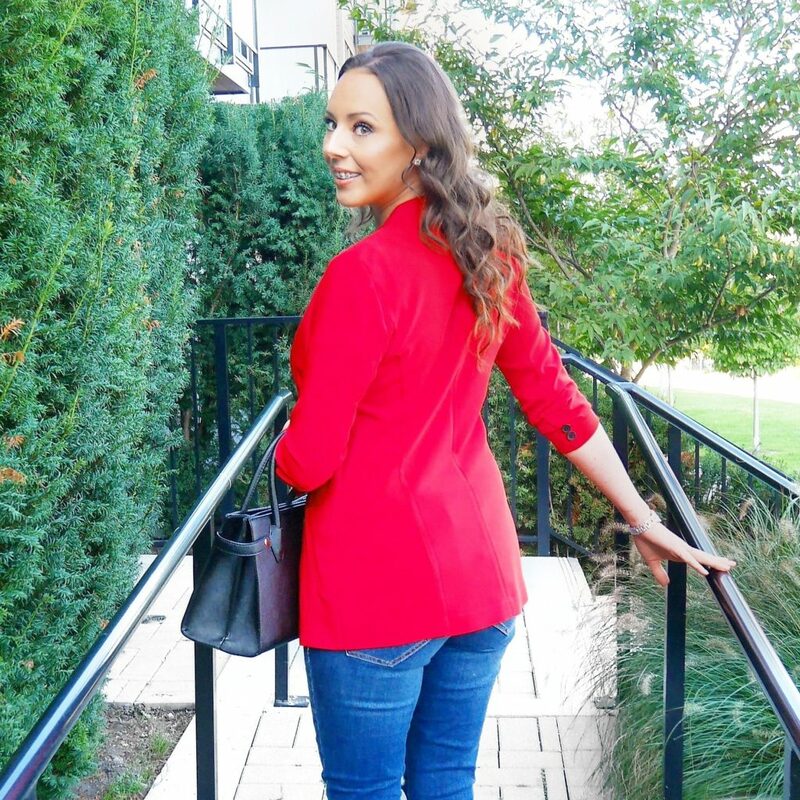 On most Fall days the weather isn’t cold enough to wear a heavy jacket so a Blazer is usually perfect for the weather.To fire up my look for Thanksgiving Day this year I wore an intense crimson red blazer with ruched sleeves. I love the stylish ruched sleeves, button detailing and modern silhouette of this statement piece. 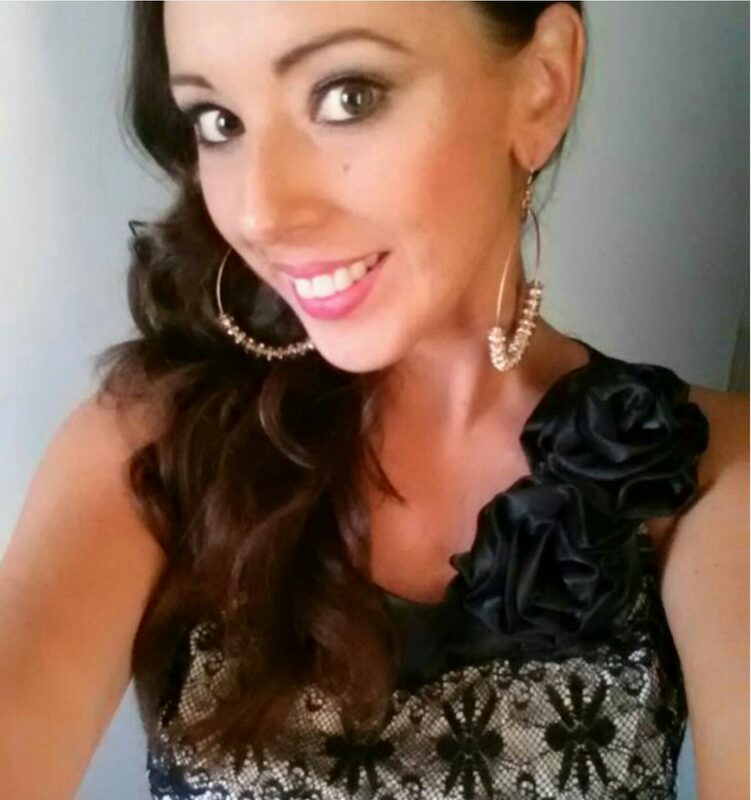 It’s such a versatile piece that I can wear to work or for an evening out on the town. Under my blazer I wore a casual t-shirt that was trendy and fun yet comfortable enough to be able to breathe in after eating Thanksgiving Dinner. 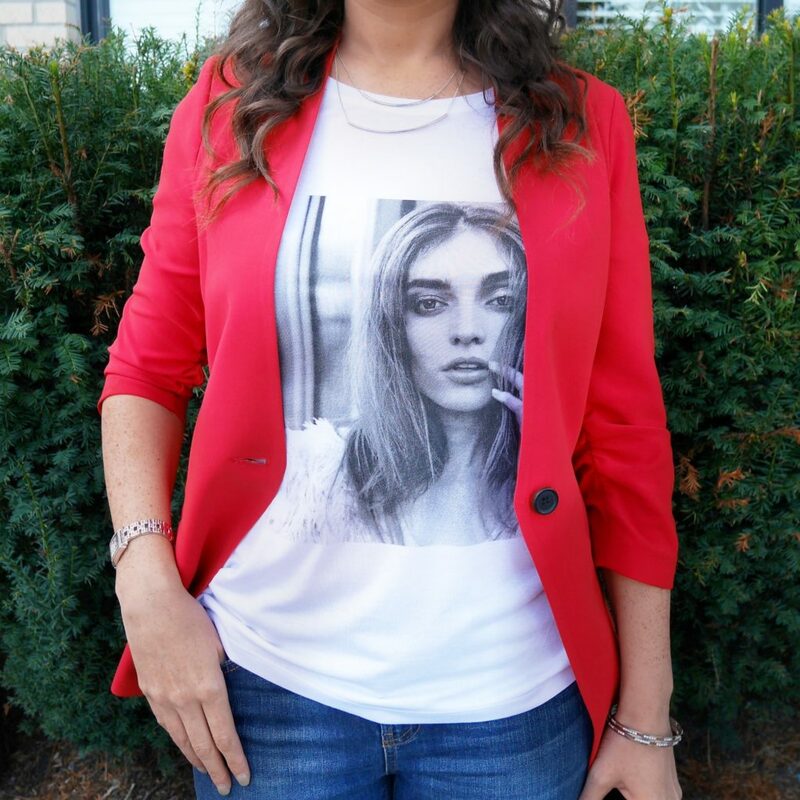 This black and white chic slogan t-shirt added a little edge to my outfit and the blazer jazzed up the casual look of the t-shirt. I’ll definitely be rocking this shirt often as it will look great under a black leather bomber style jacket. Skinny Jeans are my favorite for any season so it is no surprise I am wearing them in this look. These skinny distressed jeans are effortlessly versatile and so comfortable. The jeans feature a classic rise and a bit of stretch which are both game changing features for me in a pair of jeans. These are the first pair of jeans I have purchased with a frayed hem and I must say I loved the unique frayed detail. I paired my outfit with an over sized tote handbag that held everything I needed for the day and then some. The spacious satchel features metal details that complimented my Jewelry well. I love the size of this bag with this outfit as it was light and not too oversized. This handbag compliments any outfit. I went really subtle with jewerly for this look by wearing a necklace with two bar pendants paired with some simple diamond stud earrings. This added a touch of glam to the outfit. Since becoming a mom, I have given up the 5 inch heels and have resorted to 3-4 inch heels. 4 inch heels are the perfect height for me as they still allow me to run after the little man when he gets away. I decided to finish this look off by rocking a pair of edgy faux suede peep toe bootie heels. The side cut-out details are super cute and the zipper at the heel offered easy on/easy off access. They are very comfortable and sturdy to walk in. I hope you enjoyed reading the outfit details of my Thanksgiving Day look. This is my first OOTD fashion post and I enjoyed sharing it with you all. Be sure to subscribe to my Newsletter below to stay tuned for many more ! Now that I have revealed my love affair with the color Red I want to know what your favorite color is to wear for Fall? Let me know in the comment section below! Disclaimer: This post contains affliate links. Please read my Disclosure Policy for more information. Thank you so much for supporting the retailers that support MsDivineShyne. Love your pop of red here! Love the red! Your outfit is so cute! I love this color red on you! fabulous! 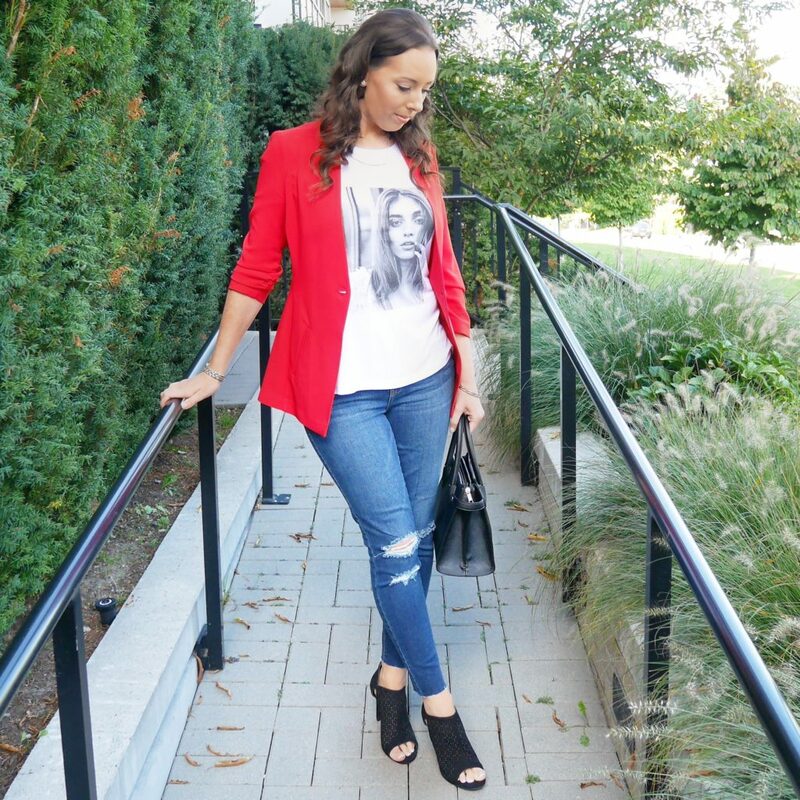 Love how you spiced up a casual outfit with a pair of heels and this gorgeous blazer. The color is amazing! I totally like your outfit, red is a great fall color! 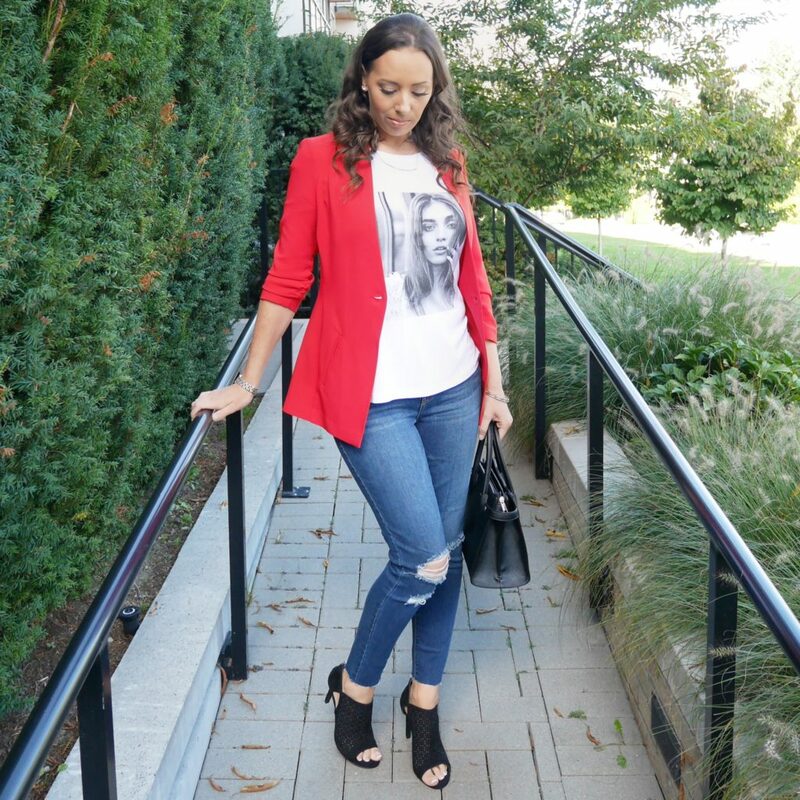 I love that red blazer with the graphic tee! So cute, girl! I love this look and the pop of red!